To ask other readers questions about To Skin a Wolf, please sign up. 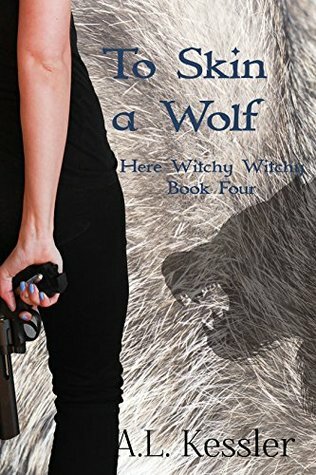 To Skin a Wolf is the 4th book in A.L. Kessler's Here Witchy Witchy urban fantasy series. Secrets are unraveling and I can't wait for the next book! The Here Witchy Witchy series continues to draw me in. In To Skin a Wolf the element of creepy reached new levels...the title says it all! I was captivated by the conflict, action and mystery on every page. Kessler continues to open the curtains a little more on secrets surrounding Abigail and it drives me mad, in the best way possible. Every layer that gets pulled back seems to lead to a hidden door, which makes for an entertaining read and a world that I enjoy visiting. Abigail's character development and strength makes her easily relatable. The fact that she can be strong and confident, but not self-centered and selfish is one of my favorite character traits. SOOOO many times I read female characters that are either one or the other and it is a breath of fresh air to have the two joined together and retain an organic feel. This was a great sequel to book 3. It really kept me turning the pages. It would be a 5 star except for the editing but I was told that was getting updated this weekend so just assume this is a 4.5 star review. I can't wait to see what book 5 has in store. I love Abby and I totally totally saw that coming with the vampire king. Felt good to be right about a prediction! Great read great story great author! This book was filled with action. There were so many things going on, and it was captivating. From the very beginning to the end, it was a great read. There are still so many questions that need answering, and I can't wait for book #5. Same great characters, but the crimes committed are gruesome. This is one I read quickly through the night because I wanted to see justice done. That bad guy had to go. Could not put it down. Amusing and laugh out loud funny when long kept secrets and surprises are revealed. You can't help but like Abigail Collins as she investigates paranormal cases, with her usual snarkiness and threats of shooting people.